Camp Charles F. Perry is the oldest continuously used Boy Scout Camp in Texas. It began being a Scout Camp in 1927, after Charles F. Perry, of Harlingen, Texas donated the first parcel of land for a Scout Camp. While Circle 10 Council in the Dallas area had a camp as early as 1923 its use was not continuous. The land that is Camp Perry is fairly recent in geologic terms. The whole Gulf coastal part of Texas is recent, being made up of soil washed off an ancient mountain range which at one time was in central Texas before it completely wore down. Over the ages, with rise and fall of sea level, the coast of Texas was defined. The Lower Rio Grande Valley of Texas is in actuality not a valley at all. It is the delta of the Rio Grande (the Rio Bravo.) The Arroyo Colorado, which forms the eastern boundary of Camp Perry is in fact one of the drainages from the Rio Grande system. The area is very flat, as are most deltas, with low hills (locally called lomas) interspersed on the landscape. For all intents and purposes there are no natural rocks in the immediate area. The land is made up of recent sediments, most clay like, with some sand. People have lived on and around this land for many centuries, perhaps millenia. The most recent before European contact were of the Coahuiltecan culture, These people were hunter/gatherers and lived in wikiups. The Spanish claims in the New World included this territory and from them we have the first records of land ownership in the modern sense. In 1794 the Las Mestenas Petitas y La Abra Grant was made to Vincente Hinojosa. In 1852 on February 10 the Texas Legislature confirmed the grant. After Texas separated from Mexico, and Texas became a State in the United States of America... and the southern border of Texas was decided by the 1845 war with Mexico, land grants were examined and confirmed to be valid under USA and Texas law. Twenty thousand acres called the “Browne Pasture” is transferred to James G. Browne. Mr. J.G. Browne died February 7, 1895 and the Pasture was inherited by James A. Browne. May 9, 1914 the Browne Pasture became the San Dominic Colonization Co. and subdivided the San Dominic town site. Also on May 9, 1914 lots 6 & 7 in Block 7 were conveyed to Anthony Gerber. These were designated as Tract 256 & the south 43.3 acres of Tract 257. Also on May 9, 1914 Tract 256 (10 acres) owned by Anton B Chapek et al. Conveyed San Domingo Colonization Co Subdiv (53.3 acres) to Anthony Gerber. On July 31, 1926 Anthony Gerber conveyed Lots 6 & 7 of Block 7 San Dominic Subdivision to Aaron W. Cunningham. On August 31, 1926 Arron W. Cunningham deeded Lots 6 & 7 of Block 7 San Dominic Subdivision to Charles F. Perry. On March 27, 1928 Charles F. Perry conveyed Lots 6 & 7 of Block 7 San Dominic Subdivision to the Boy Scouts of the Rio Grande Valley in trust with the trustees being the County Judges of Cameron, Willacy, Hidalgo and Starr Counties. On June 3, 1935 a court case between Pilar Villarreas vs. A.A. Browne et. al. Awarded the North 10 acres of Lots 6 & 7 San Dominic Subdivision (designated as Tract 256) to the 4 County Judges in trust to the Boy Scouts of the Rio Grande Valley. On June 1, 1931 money was loaned (to Gerber?) and the land was held as collateral to Continental Steel Co. On May 25, 1936 the loan was considered defaulted and Continental Steel foreclosed. On April 9, 1943 Continental Steel conveyed Tract 253 to F. Earl Davis & Oscar Robinson. This transfer of land enlarged Camp Perry. The land was actually conveyed to a list of Trustees for the Lower Rio Grande Valley Council. Cleve Tandy, W.W. Housewright, Shelly H. Collier, Lugher Hughes and Lloyd Bentsen. On August 22, 1934 9000 sq. ft. (180 ft x 50 ft rectangle fronting the Arroyo Colorado) was deeded to the Mayor and City of Harlingen as trustees for use of Harlingen Boy Scouts. In June 14, 1935 Charles F. Perry & wife Velma conveyed Tract 257 to his Virginia Perry. On December 20, 1945 A. B. Westbrook & wife Connie Mae (Perry) Westbrook conveyed 1 acre of tract 257 to C. Tandy, W. Housewright, S. Collier, L. Hughes, and L. Bentsen trustees for the Lower Rio Grande Council, BSA. On April 12, 1950 A. B. Westbrook & wife Connie Mae (Perry) Westbrook conveyed the remainder of tract 257 to C. Tandy, W. Housewright, S. Collier, L. Hughes, and L. Bentsen trustees for the Lower Rio Grande Council, BSA. Subject to easements. On January 25, 1983 these trustees conveyed the land to the Rio Grande Council. 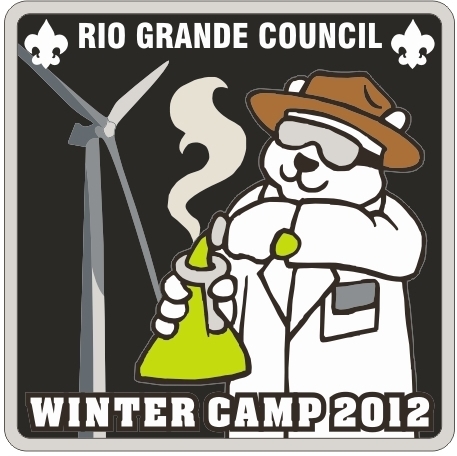 In general during the early years there was no good mechanism for the Scouting movement in the Rio Grande Valley to own land. The corporate structure of BSA Rio Grande Valley was not deemed mature enough, so some of the land was put into a trust with the trustees being the County Judges of Cameron, Willacy, Hidalgo and Starr Counties. Other parcels of what was to be Camp Perry was held by a trusteeship embodied by a number of wealthy, powerful and trustworthy men ... Cleve Tandy, W.W. Housewright, Shelly H. Collier, Lugher Hughes and Lloyd Bentsen. This ownership scheme continued up until 1983, when the Council asked each County Judge to cede his interest to the Rio Grande Council of BSA. Each did, with proper action from the Commissioners Courts of each County, and title(s) were conferred to the Council. 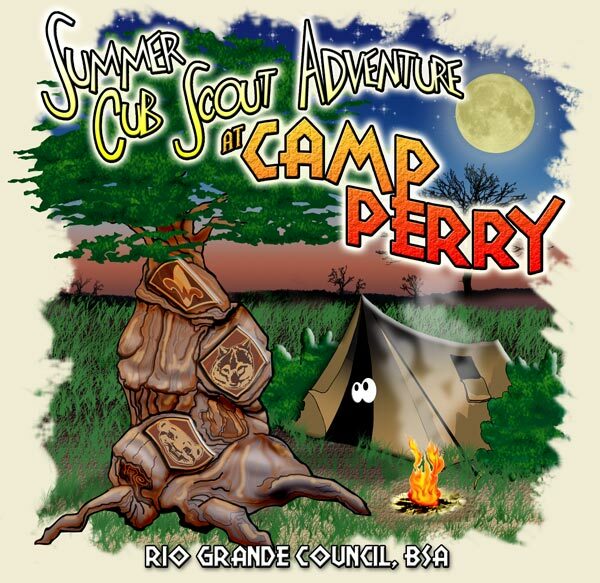 On March 14, 1983 the 4 county judges (of Cameron, Willacy, Hidalgo and Starr Counties) conveyed their trusteeship of the parts of Camp Perry which they held to Rio Grande Council Inc., Boy Scouts of America. 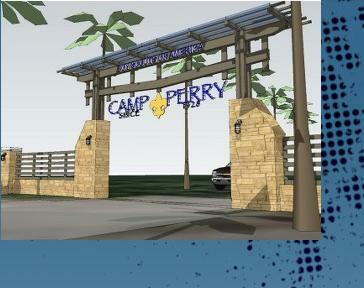 Camp Perry was finally actually owned by Rio Grande Council. Bill Hubbard was the person who went to each County Judge, and met with each County Commissioners Court to get the resolution needed for this transfer. The first approached was Cameron County because Bill personally knew that County Judge and was fairly sure of a positive result from the request. In all Camp Perry is composed of some 260 acres along the West bank of the Arroyo Colorado. The above information comes from official land records. If it seems confusing to you, be aware it was confusing to me. See the maps. Note: when the word “conveyed” is used above it means that the land changed ownership. It is not known which changes of ownership were by donation and which were by gift. The first camp was conducted before the title to the land was transferred. In the Summer of 1927 there were 151 Scouts and 16 Leaders camping at Camp Perry. Summer camp 1928 had 298 Scouts and 33 Leaders. The Council was visited by E.E. Voss Regional Scout Executive from the 9th District of BSA. One of his strong recommendations was that development at the Camp cease until the outstanding debt of $3600. would be retired. Judging from the tone of the letter sent to Charles Perry on August 2, 1929, one can infer that a considerable amount of “development” (building) had taken place very early on in the history of the Camp, and that Charles Perry was not totally happy with the progress. The Bowl, (small amphitheater) was built by R.W. Liston of the W.T. Liston Co. and was one of the first things built at the Camp and existed for the 1929 camp photo. The eagles at the top of each wing of the amphitheater disappeared during Hurricane Beulah in 1967. Robert L. Lyon was Camp Director – August 29, 1930. 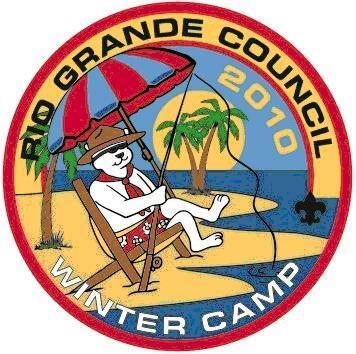 The Rio Grande Council 4th Annual Report noted that 154 boys and 51 men attended Camp Perry. It also noted that the Arroyo was not fit for swimming. Swimming was done at the Midway Pool near Harlingen. It was noted that there were fewer Summer Campers in 1930 than there had been in 1929. Camp Perry was inspected by National Officials (BSA?) and the camp was “highly complemented.” During this summer requirements for 122 Second Class tests were done, 80 First Class tests and 86 Merit Badge tests were met by the Scouts attending. Three Eagle Badges were awarded at the Camp Court of Honor. A photo of Camp Perry published in December 29, 1930 and taken from the East side of Arroyo Colorado shows the development of the Camp including the Lodge in its original 2 story condition as well as the 2 story Harlingen Lodge, “the Bowl” amphitheater, the Dining Hall and a water tower. Summer Camp 1931 served 162 boys and 26 leaders and was active from August 3 through August 15. The Troops camped in individual campsites, along the Arroyo bank, under their own leaders. These leaders were largely responsible for their own programs. Previous to 1931 the Council rented tents for about $250. per year. In early 1931 the plan was to purchase 20 Khaki waterproof and mildew proof tents for $525 and have them available for use all year. 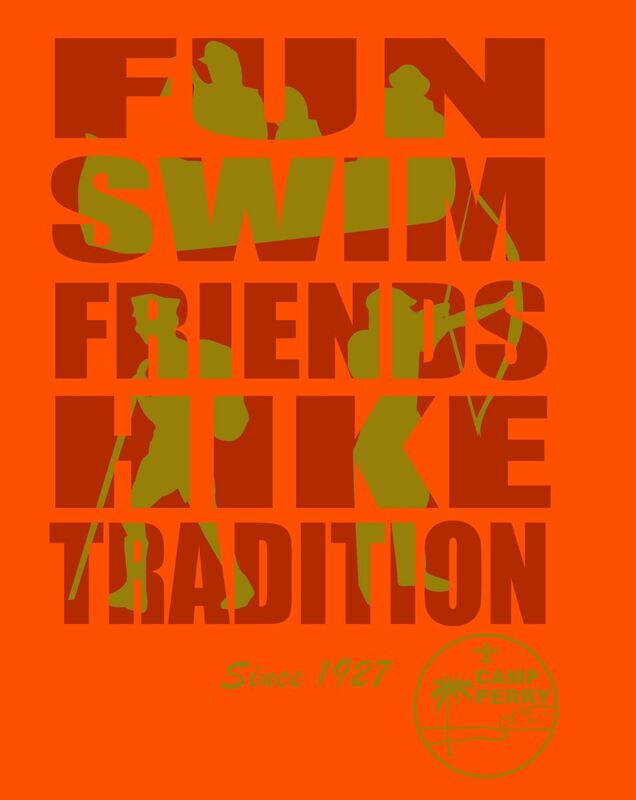 During some of the early years swimming was done in a pool in the Girl Scout Camp in Rio Hondo. That pool was where the Rio Hondo Public Library is currently located. James E. Nolan was “custodian of Camp Perry.” He arrived in Rio Hondo in 1934 and was prominent in Boy Scout activities for 14 years. He died Oct. 9, 1952 (information from his Obituary) During the early years there were times when there was no resident Camp Ranger. Ted Luten was Camp Ranger from as early as 1948 until 1956 Buddy Johnson was Camp Ranger – 1956 - 1983 Pete Langan was Camp Ranger – December 1983 to 2010. As of 2010 the Camp Ranger is Jose Dacasa. The Harlingen Lodge was a 2 story structure of logs. As with the main Lodge, the logs were in all likelihood telephone poles donated by Central Power and Light (CPL). It was located on the bank of the Arroyo Colorado between the Ranger's house and the existing OA Lodge (which is connected to the current kitchen.) Some concrete work still exists near the top bank of the Arroyo, including steps leading down toward the waterside, which was part of the Harlingen Lodge construction. It can be seen in the 1930 picture, and was probably built in 1929 as one of the original structures on the camp. Troop 47 from La Feria made a bunkhouse (known as the La Feria Lodge) at the Little Arroyo at the southern edge of Camp Perry. This had 30 bunks, 12 showers, 12 commodes, 12 wash basins and cooking facilities. This building was used for a number of years and began to be undercut by the Little Arroyo. The La Feria Lodge was dismantled before it nature destroyed it by the slab foundation being undercut by the Little Arroyo. That foundation finally tumbled into the water, and a large concrete slab can be found about a foot underwater at the mouth of the Little Arroyo where it joins the Arroyo Colorado. The Little Arroyo at the south end of Camp Perry is an extension of the North Main Drain of Cameron County Drainage District 5. In the mid 1940s Boggus Ford often provided a truck for use of Camp Perry in the Summer. Sometimes when food supplies were short friendly vegetable farmers in Willacy County opened their fields to be harvested (gleaned) by Scouts. The truck would leave camp with some Scouts and they would dig potatoes and pick crops filling the truck and providing produce to feed the campers. 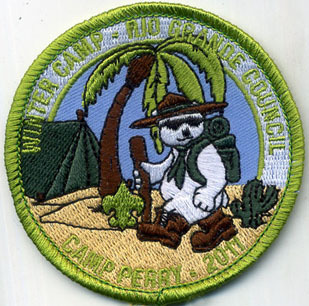 A Camp Perry week in the 1940s included work toward rank advancement including longer hikes, up to 12 miles overnight to Goat Island near the mouth of the Arroyo. Other hikes went north along FM 1420 to Wilimar. Robert (Bob) Whalen (of McAllen) had been to Camp Perry as a scout in 1944, as had Tom Weekly (then of Alamo, now of McAllen). Their memories of the camp are the earliest available when this history was compiled. Robert (Uncle Bob) Whalen was Camp Perry's Camp Director from 1987 through 1995 when the new Scout Exec. Steve Gerber decided that the position should be occupied by a Scout professional rather than a volunteer. In 1943-1944 Camp Perry activities included the use of “crew boats.” These were rowboats (probably double ended, like lifeboats) which had 4 oars for rowing and 1 at each end. These “crew boats” were used for transportation when the road (the old south road which came in just north of the Little Arroyo and extended to the Ranger's house) was impassable. The Scouts were taken in to Rio Hondo to swim at the Girl Scout Camp Pool. The Quartermaster would go into town for mail and supplies he would bring back the perishable supplies, meat and certain vegetable and 300 lbs. of ice. Most of the time by truck, sometimes by “crew boat.” The camp operated for 6 weeks in the Summer with each 2 week session costing $25. The Health Lodge was located on the first floor of the Harlingen Lodge in 1944. The “crew boats” were also used to take the Scouts to “Bird Island” before the Arroyo Colorado was dredged. It was so shallow that on occasions all had to disembark and pull the boat over shallow spots. They camped on the island for a few days as a remote camp. In 1944 the O.A. constructed a wire which led from a high place down to the ceremonial fire pit. A metal arrow was constructed and hung on rings. The idea was to wrap the arrow with cloth soaked in flammable material and have it slide from a place out of sight down into the fire pit. In fact the arrow slid part way down and stuck, overhead from some of the observers, and dripped flaming fluid. Nobody was hurt, but the stunt was not repeated. During this time the Dining Hall was half the width of what it is currently (2008). If you look at the concrete slab foundation you will see that there is a seam down the middle which shows the width of the original Dining Hall. This original hall was open, not screened and had mesquite log rails. The cooks at camp were military (army) on TDY from Harlingen Army Air Field. They often served sausage made at the local children's home, and sometimes served meat from the exotic nilgai found on some South Texas ranches. Bob Whalen remembers nilgai (a large antelope) as having dry meat. The Harlingen Lodge was where camp staff stayed. It had 4 rooms on the 1st floor and 4 rooms on the 2nd floor. One room on the 1st floor was used as the Health Lodge. In the 1940's Mr. Perry, Superintendent of Schools in Mercedes was Camp Director. Later Bud Bohner, a mail carrier served. Later Bud's son, an ex-Marine who was also on the Marine Military Academy staff served at camp. Tom Weekly who was a Scout at Camp in 1943 remembers a Sgt. Myers as a particularly influential leader. He also remembers that during these war years that marksmanship on the rifle range was celebrated. One could earn a marksman medal, followed by pro marksman and sharpshooter bars to the medal. Seven mile hikes down the Arroyo to the mouth, camping there and returning were regular parts of the offering. A normal day would start with revile, wash up then walk past the pool to the chow hall. Activities included shooting, archery, knots, fire building (sometimes with flint & steel). Evening activities included storytelling by the campfire and roasting marshmallows. 1950 Camp Perry opened for summer camp, then closed in 2 days due to a Polio scare. Camping that year took place at “Redfish Bay” which is what Port Mansfield was known before the town was established. Bob Allen, the President of Rio Grande Council, bought some surplus military tents, had platforms built on which to pitch the tents and hired the Camp Perry Staff to hold camp that year. The Trading Post, Kitchen and Dining Hall were rebuilt in 1954. The Swimming Pools (older pools located near the Arroyo) were remodeled and completed in 1958. They were built in the early 1950's. 1951-1956 Rayburn McNally was on staff at Camp Perry. The campsites were numbered 1-12. They were smaller than the current campsites. Each campsite had a small shelter consisting of concrete slab about 10 ft. x 12 ft. with pillars at each corner and a concrete top. There were slits down the middle to allow smoke to clear. These were made by, or with money from, the Lions Clubs of the Lower Rio Grande Valley. Scout Executive James Goldstein was of the opinion that these made living too soft at camp and that camp should be of a more rustic nature. He had these shelters removed. Sledge hammers, and perhaps a small bulldozer were used to demolish them. Their destruction dismayed the Lions Clubs, as the various clubs had created these shelters and each had a dedicatory plaque on it declaring the name of the club which was responsible for that individual shelter. At first there were only campsites on the north sided (north of the Ranger's house). The campsites on the south side were built in the 1960's. When the Camp Director's Cabin was being refurbished some time in the early 1980's, it was discovered that it was made of old ammunition crates. Markings on the wood indicated that it had once held 105mm howitzer shells. During the early years of the Harlingen military installation, when it was an Army/Air corps base it was an artillery training center. There was a large “tin” (corrugated iron) building which was located between where the existing Adult Showers are and the Office building. (The big white patch on the circa 1955 aerial photo.) This was built by Buddy Johnson who was a welder. On occasion a wire rope (cable) was stretched from that building to a point on the ground and a come-along tensioned it up until manipulating the cable would cause the whole building to moan. This noise was the voice of the mudflat monster, a bogey man created by staff to influence (scare) the younger Scouts. Pete Moore was one of the most convincing Mudflat Monsters. He constructed a monster head much like a wildcat, with reflectors for eyes in the head and a mechanism to cause them to wink at those who would shine a flashlight toward the head. The Mudflat Monster was alive and well into the 1990's when the fun got more intense than officialdom would allow. 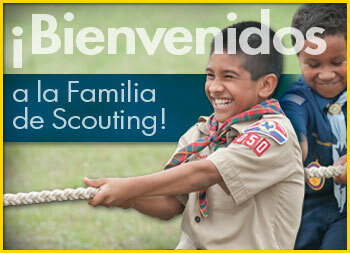 Scoutmaster Barbee of a troop in the Weslaco area reported that the younter members of his troop were unduely terrorized. The Mudflat Monster is no more. During a historical festivity in May 2011 a carved and gaudily painted helmet style mask of the Mudflat Monster was revealed and modeled. The Mudflats are located on the north and south sides of camp, on the west side, up against FM 1420. They are the areas where dredge spoil was deposited when the Arroyo Colorado was dredged to make it into the Harlingen Barge Canal. As the spoil is viscous and skins over on the top, leaving pudding-like mud underneath. An unsuspecting person walking over the top could break through and possibly get fatally stuck. For this reason these 2 areas are strictly off limits to all. When the dredging was active in 1953 and at other times later the stench of the dredged up spoil was awful. The “new” road (the currently used road) into camp was not originally paved. Rayburn McNally remembers that when it rained it got soggy and supply trucks bringing in foodstuffs etc. could not get in all the boys of the camp were invited to tow the truck in and out. A large rope (was a ship's hawser) was tied to the truck and the 150 or so Scouts pulled it in to the kitchen, and back out to the road when it was unloaded. Bud Bohner who worked with Cameron County Civil Defense had Camp Perry added to the list of Rescue Centers for Civil Defense. As it was duly registered county funds could be used to pave the road from FM 1420 to the buildings which could be used as Rescue Centers. This is how the road into camp got paved at no cost to the Council. Harlingen Army Air Field, later called Harlingen AFB, was decommissioned in 1962. During the process which lasted a year, a fair amount of material was donated to Camp Perry, including large cooking pots, and kitchen cutlery, spoons etc. Pumas (Mountain Lions) used to travel through Camp Perry during their migrations as late as the early-mid-1960's. At an Order of the Arrow event Danny Baker was dressed out wearing a Mandan (with feathers on his head) and was positioned near the Scout Sign just west of the camp kitchen when he saw a Puma walking up the road. It seemed to be attracted to the feathers in the hat. The Puma seemed to realize it was attached to a human, and wandered off. On another occasion a campsite was seriously messed up by a couple of wildcats who seemed to be fighting over a kill of a rabbit. The campsite just happened to be in the way of their squabble. The old Lodge building (with chimney) was condemned in 1953, but was still used up to 1955, when it was torn down, and rebuilt. The old logs which were the walls were recycled to a number of things around camp. It is likely that the two story Harlingen Lodge building, which was located between the Dining Hall and the Ranger's house, along the bank of Arroyo Colorado, was taken down at the same time. The Camp Perry chapel, the called the Wayne E. Thompson Memorial Chapel, was an “A” frame building which was constructed in 1960 by Freddy Abbott a scouter who was a welder. It had a metal pipe frame and a corrugated iron skin. There was a small building made of concrete block for storage of hymnals etc. Over time the skin rusted and came off (was blown off in Hurricane Beulah in 1967) and the framework stood for some time. It became lose and clanged in the wind. Ranger Pete was told to remove it, and found someone who would remove it for the metal, which was taken away as scrap. In 2007 Pat Liston (of R.W. Liston Co.) constructed a new chapel on the same site. This one has a very sturdy galvanized metal pavilion frame. The Order of the Arrow received a matching grant and constructed benches, which were set in concrete footings on September 20, 2008. Rayburn McNally knew signaling, including wigwag and semaphore. One of the main reasons he got a staff job at camp was to teach this to Scouts who needed to know to achieve 1st Class. Two towers were built by CP&L in the late 1950's. One at the northeast corner of the berm of the south mudflats, and the other at the southeast corner of the north mudflats. The distance between them was about a quarter of a mile, a good distance to use for flag signaling. The Order of the Arrow area was improved by a Scoutmaster named Al Francine. They built an iron building with concrete foundation. Smudge pots were set out and connected with tubes from butane tanks in the building. Igniters were set into the smudge pots and the butane could be controlled from the building and the flames could be lighted, dimmed or flared from that remote location, making for impressive ceremonies. 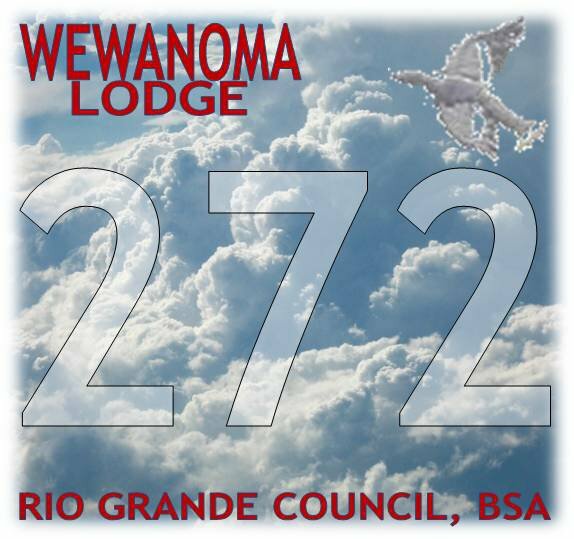 There was a high mosaic wall with a Whitewing dove on it, the totem of Wewanoma Lodge. The building was torn down at the behest of a later Scout Executive who maintained that it was out of character with the Amerind roots of OA. Brick outline tipis were made of the remains. (see the middle of the aerial photo circa 1955) The next Scout Executive found fault with that and had that taken down. Often the "take down” took a lot of work with sledge hammers. The Order of the Arrow was very active in the 1950's. Work groups of over 200 boys were available and used to accomplish some of the major building (and perhaps un-building) tasks. Fred Abbott welded the very tall flagpole on the parade ground. This was erected in the 1960's. It was set up by a CP&L pole truck. The dedicatory plaque says “In Memory of Henry Hemingway Advisor Post 7.” This flagpole was blown down during Hurricane Dolly in 2008. It was measured on the ground after it blew down. From the flange on the bottom to the top of the ball at the top it was 66 feet 2 inches tall. A very robust replacement flagpole, complete with an eagle on top was installed in 2010. The bell which had hung under a tree just south of the flabpole was re-hung in a 3 dimensional fleur-de-lis near the flagpole. A pentigonal dedicatory brick pavement around the bell structure was built in 2011. Hurricane Beulah in 1967 did a lot of damage to Camp Perry. There was at least 4 ft. of water over the camp. Water rushing down the Arroyo, which drains a goodly part of Cameron County, cut away the trail along the waterfront. This trail was used to walk from one part of the camp to another along the waterfront, rather than having to walk the road which runs North and South through the camp. James N. Goldstein was Scout Executive during and after Hurricane Beulah. The devastation made national news and donations to rebuild Camp Perry, and generally assist Rio Grande Council came in from a very wide variety of Scout troops and councils throughout the region. Other help included $900. from the Sears Roebuck Foundation, and $2160. from the Jewish men's organization Hobnail Brit for rebuilding the chapel. The Frank Phillips Foundation of Squaresville, OK authorized a grant of $10,000. if matching funds would be available. The first communication received from BSA National Office in New Brunswick, NJ offered condolences on the losses and suggested that there was no money to assist the Rio Grande Council. A few months later BSA National Office made a no interest loan of $19,085. to the Rio Grande Council to assist in rebuilding. The letter of transmittal signed by Alden G. Barber Chief Scout Exec. said that National was impressed with the efforts being taken within the Council and Region 9 to meet the budget of Rio Grande Council. Tom Roccio and his troop from Edcouch Elsa (a bunch of 12 and 13 year olds) built the bridge across the little Arroyo in the 1970's. It was a rope bridge slung on robust wire cables slung from stands of telephone poles and well anchored at both ends. It had thick wooden slats made of oak to walk on. Tom worked for CP&L as a contract pole setter. On the North side he used it to set the poles which anchored the bridge. On the South side the poles were buried digging by hand. Over time the wood weakened and it was considered unsafe. This bridge was removed during the summer of 2008 when Hurricane Dolly came through. Tom Roccio also had a small case tractor (the type with caterpillar treads and a blade). He assisted opening a number of the sattelite campsites. Some of these stayed open by use and brush cutting, and others fell to nature's overgrowth. In the 1970's the Health Lodge (as a separate building located just north of the OA Lodge) received screens on the windows and a re-roofing and closing off a door on the east side. This building is made of large brick, painted dark red. The Hospital Sip USS Hope (AH-7) was sold for scrap in 1978. Andy Marine of Brownsville dismantled the ship. Some items from the ship were donated to Camp. A number of military mattresses were donated. Some thought they might be unsanitary and most were ordered destroyed. Since the Arroyo Colorado was dredged to become the Harlingen Barge Canal in 1953 there has been considerable commercial barge traffic to and from the Port of Harlingen. Often the barge “tows” are small enough, mostly single barges with a robust “pusher” towboat. The individual barges are quite large, and often are full of liquid cargo of some sort of petroleum distillate. It is quite un-nerving to see tens of thousands of gallons labeled “danger Benzine” floating past the camp. When the barges are empty they ride high in the water. Water sports, canoing, rowing, motor boating, water skiing and small boat sailing, need to be practiced with one eye out for Barge Canal traffic. The big tows can not stop in any reasonable distance, so it is the duty of the smaller vessels to make way. This is especially needful as the Arroyo curves and one can not see very far up or down stream to note the coming of commercial traffic at distance. Camp Perry's waterfront is on the outside of a curve in the Arroyo, and as such is more vulnerable to a stray, or poorly aimed barge coming in contact with the shoreline. The in 2000 the “boat docks” are a floating structure which is pulled out of the water up the steep bank when camp is not in session. This protects the dock from destruction should an errant barge come its way. The shade building at the waterfront is re-built in May 2011. The existing Adult Showers were built by McAllen Troop 78 in 1991. Bob Whalen was the Committee Chair, who was instrumental to getting it funded and built. This Troop did an annual Halloween pumpkin sale and made $6 - $7000 per year with this event. This level of fund raising allowed them to be able to fund the shower building. Two staff quarters buildings, both 16 ft x. 48 ft, were built between June 6, 2005 and December 2005 with refinements to the buildings continuing to be added through Summer 2006. Magic Valley Electric Coop assisted greatly with the cutting of the piers which were cut down power poles. These are located West across the N-S road from the Ranger's house, and one farther south from that. Scott Workman was Scout Exec. during the beginning of this construction. Previous to these being built the staff lived in wall tents which were pitched inside what are now the 14ft x 70ft storage barns. These were built some time before the 1955 aerial photo, and from photos of Hurricane Beulah damage it is evident that they had to be re-built after the storm. Shortly after 2000 two running water shower houses/bathrooms were built. The first on the North side of Camp, on the East side of the road, and the second on the South side of Camp on the West side of the road. Each has 4 individual showers and 4 individual bathrooms with a equipment room on the end. They are substantial buildings, sided with rough cedar plywood siding, on large cement slabs. Some time between October 2007 and October 2008 the North and South Shower houses (with flush toilets) were painted to match the other buildings in camp. Previously they were weathered wood silver/gray. On July 23, 2008 Hurricane Dolly very nearly came direcly over Camp Perry. Damage was not as bad as it could have been. Several of the camp building's roofs were damaged. The Crafts center and the Office got new metal roofs shortly after the Hurricane Dolly, and were installed before 1 September 2008. The Office building had considerable mildew damage and was unusable for quite some time. The Little Arroyo was scoured clean of accumulated brush and debris. The outside curves of the banks had considerable erosion. Camp Perry in 2001 aerial by US Soil Conservation Serv. Life at a summer camp is a formative experience for young men. They often experience freedom not known at home, and some fondly remember pranks which might not be tolerated in modern times. Many men's fondest memories of summer camp revolve around non-sanctioned activities. .... carefully cultivating eggs in the South Texas sun so they would become properly rotten, bringing them to camp, climbing up to the 2nd floor of the lodge and throwing them at a Scout encampment.... then running away, in a direction away from their own camp so they would not be caught or suspected. It worked, and only can be told now, some 55 years later, and even then without specifics. This document is a living document, and may be updated, clarified, and corrected as time goes on. and others who made information available to me.